I have been familiar with the Kings Food Market chain since I moved to Hoboken many years ago. There are two small locations on either side of town and both are always filled with young professionals picking up the essentials: fresh fruits and – especially – the prepared foods. Recently I was invited to the Ridgewood location of Kings for a preview of not only the remodeled store, but something the Garden State will surely welcome: a 24-hour produce program. The 24-Hour “Just Picked” Promise is Kings’ commitment to make locally grown, farm-fresh fruits, vegetables, and herbs available to shoppers within 24 hours of being picked – giving shoppers the benefits of a local farm stand in the convenience of their neighborhood food markets. As one who can’t always make it to a nearby farmers market, I love the idea that I can walk into Kings at any time and pick up fresh fruits and veggies. 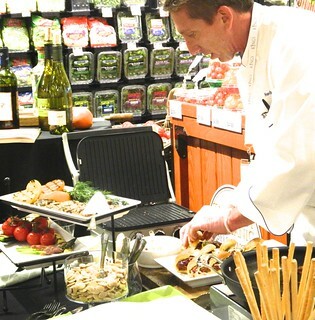 Bill Hedge, a former chef and now director of prepared foods for Kings Market, greeted us from behind a sizzling grill. Our first taste was a black bean soft taco: black been puree, goat cheese, smoked paprika and Monterey jack cheese. This was paired with a homemade margarita recipe designed by Paul Guarino who oversees the Fine Wine & Spirits department at the newly renovated Ridgewood location. He says it’s the Mexican beer that gives it just the right flavor. The tacos were great and would definitely be welcomed (with a few margaritas) after a long day. For a real taste of summer we were served BBQ sliders next. Soft, fresh rolls piled high with tender shreds of meat and spicy BBQ sauce. What goes better with BBQ than a Zinfandel? We enjoyed the Marietta Old Vine Zinfandel, at a modest price point of $13. Each new bottling has ¼ of the old lot added to it to keep the consistency. From the great flavors pouring out of the glass, I understood why Marietta wants to produce a consistent product. 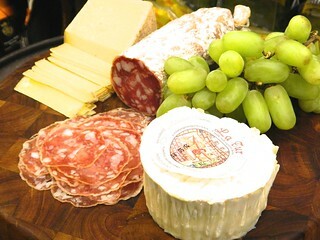 The last tasting of the afternoon was a gorgeous plate of meats and cheeses: Columbus Felino – an Italian salami, Cherry Grove Farm Herdsman cheese and an Alta Langa La Tur – a heavenly blend of cow, sheep and goat’s milk cheese. The final tasting was paired with a modestly sweet Moscato from producer Saracco. 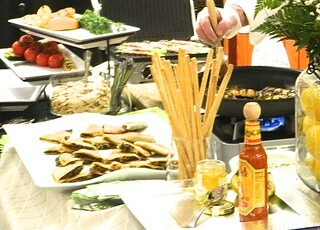 I was definitely impressed with the spread, especially since the prepared foods are available on a daily basis and always kept fresh. 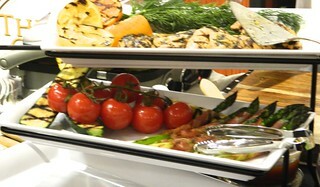 The foods are prepared at a local commissary by Kings Chefs and delivered throughout the week. “Keeping it fresh and simple is what people enjoy. And we have a lot of fun doing it,” said Guarino. Hedge added, “Everybody who works for Kings loves food.” Their passion is obvious from the selection, to the variety, to the presentation. 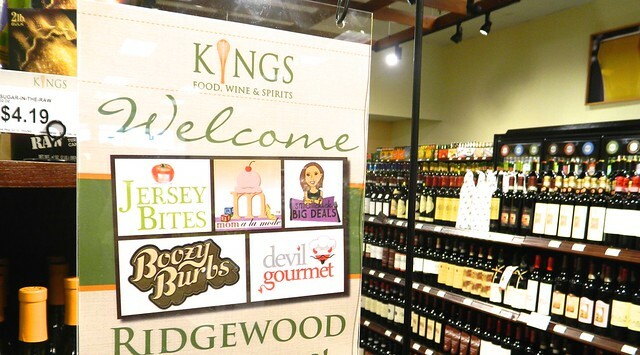 Kings works with a network of more than 25 regional farmers throughout New Jersey and Connecticut – in towns such as Vineland, Mullica Township, Swedesboro, Landisville, Buena Hammonton, Newfield, Medford, New Lisbon and Millmay – to deliver all of its “Just Picked” produce fresh to Kings stores within 24 hours of being hand picked. The 24-hour produce program runs until Labor Day, so you can enjoy the fresh produce all summer long. Luckily, the great prepared foods are a year-round treat!